From the Art Tour website: “Tours of east London’s most exciting and often hidden contemporary visual arts venues: a unique chance to meet emerging artists, see cutting-edge work and encounter art projects which stimulate, challenge and occasionally baffle the viewer. Each tour is a one-off, taking in different spaces, galleries and shows on an ever changing ‘curated’ schedule. Led by Hymie Dunn, an arts professional with 25 years experience, we travel through east London either in a small private coach or on walking tours to Hoxton, Stepney, Bethnal Green, Mile End, Hackney Wick and the Docklands, visiting a wide range of galleries, warehouses, and artists’ studios, taking in London’s only lighthouse and venues on the perimeter of the London former Olympic site. In each venue we meet the curator or artist who gives us a first hand interpretation of their projects. 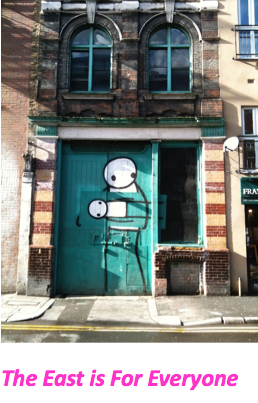 This entry was posted in Art and tagged Bethnal Green, East London, Hackney Wick, Hoxton, London, Stepney, Visual Arts. Bookmark the permalink.